"Fits in the palm of your hand and prints 2"X3" photos." The traditional gift for a first anniversary is paper, so how about a pocket-sized photo printer? 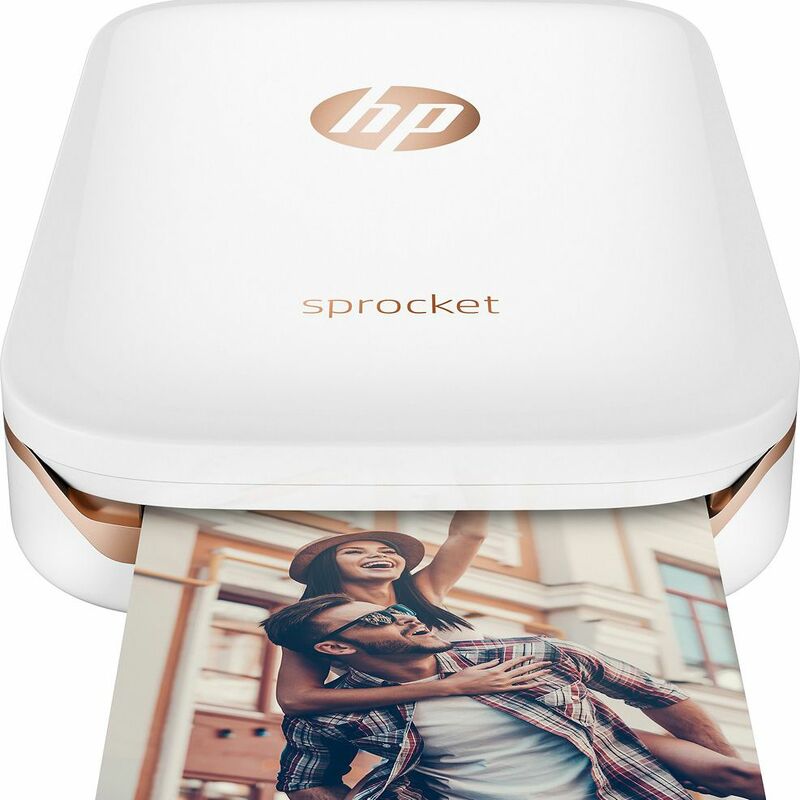 The HP Sprocket Photo Printer is a great gift to give a woman that loves to capture every special moment. The Sprocket fits in the palm of your hand, and prints pictures measuring 2" x 3". It’s simple to use and connects to your phone or tablet via Bluetooth. Just load photo paper inside (the unit includes 10 sticky-backed photo sheets to get you started), then get ready to print up some memories! Lots of people love the Sprocket for capturing special moments and adding them to a journal, or for printing pictures on the spot during memorable events. Either way, the Sprocket stands out for its portability and ease of use. Your leading lady will love capturing all your special moments together and saving them for the future. Take a peek at some of the other best first year anniversary gifts you can buy. For your 2nd anniversary, give your sweetheart the gift of sweet dreams with a high-quality sheet set like the Luxe Core Collection from Brooklinen. Cotton is a traditional choice for a second anniversary, and these 480-thread count sheets are seriously soft and well-made. People rave about how well they wash and how cool they are to sleep on. The Core Sheet Set includes a fitted sheet, flat sheet, and two standard-size pillow cases. Available in more than a dozen colors and patterns, there is a set that will match any bedroom décor. Surprise your significant other with a gift that promises sweeter sleep and lingering mornings, thanks to the Brooklinen Luxe Core Sheet Set. Take a peek at some of the other best second year anniversary gifts you can buy. Are you celebrating a milestone anniversary or an especially memorable year together? Give her a gift as timeless as your love – a diamond necklace, like this half-carat sparkler from TruMiracle. A diamond pendant is always on-trend and adds a touch of class to any outfit. This half-carat round-cut diamond is suspended in the TruMiracle setting — which is designed to enhance the size and appearance of the diamond. Fine jewelry often carries a hefty price tag, but this necklace is a relatively affordable choice for a diamond sparkler. Most people who purchased the necklace found that it looks bigger than its half-carat size and they love wearing it with anything from dresses to jeans. They say that diamonds are a girl’s best friend, so give the woman in your life a new diamond necklace to celebrate your special anniversary. Are you looking to get closer to your significant other in the coming year? Does your wife or girlfriend always ask, “What’s on your mind?” Get the conversation started with Uncommon Questions deck of conversation starters for couples. The deck of 200 cards features intriguing, unexpected, and insightful questions that each of you can take turns answering. The cards explore childhood memories, dating dilemmas and what-if scenarios. It’s also good to know that these cards are appropriate for family use or a group setting. People that have tried the conversation starters find that the ensuing conversations are often lively, sometimes emotional and usually end with laughter. 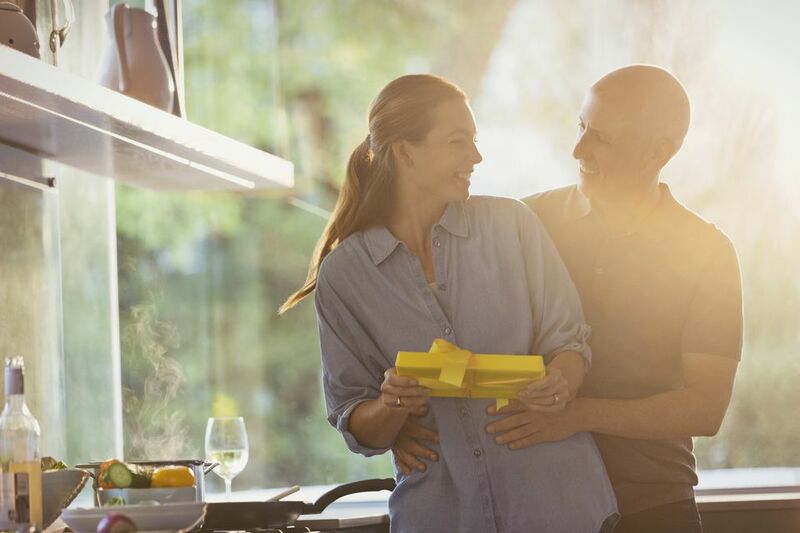 The cards are credited with bringing couples closer — and providing hours of entertainment on road trips, lazy afternoons, and low-key date nights. Give the gift of getting to know each other better with Uncommon Questions Conversation Starters for Couples. Does the special someone in your life need a moment of relaxation? Give her the gift of bubble bath, made more special with this Bath Bomb Gift Set by Rejuvelle. These bath bombs have exploded into the market for at-home spa products thanks to their unique formula and high-quality ingredients. The Rejuvelle bath bombs are made in the USA and feature a blend of 3 natural oils for superior moisturizing. Included with this gift tin are six bath bombs presented in vibrant, colorful wrapping paper. Each of the 2.5-ounce bath bombs features a different blend of essential oils, including varieties such as orange, bergamot, lavender and vanilla. People rave about the long-lasting fizz and scent produced by the Rejuvelle bath bombs. They have a reputation for making skin silky smooth, but because the bombs themselves have no dyes, they won’t upset sensitive skin or stain bathtubs. Pamper your wife or girlfriend on a special anniversary with this Bath Bomb Gift Set from Rejuvelle. Does the woman in your life love to accessorize with jewelry? No doubt she has a treasured collection of earrings, necklaces and bracelets ready for any occasion. A jewelry box makes a beautiful and practical choice for an anniversary gift. The Mid-Century Jewelry Box from West Elm is a thoughtful choice. Finished in a champagne lacquer, this wooden jewelry box will hold all of her precious pieces and features space for necklaces, rings, earrings and more. Make it even more personal by adding your lovely lady’s initials as a monogram. Choose the West Elm Mid-Century Jewelry Box as a perfect present for the woman that loves to sparkle. For a woman that loves to cook, there is no other kitchen appliance that can rival the KitchenAid Artisan 5 Qt. Stand Mixer. This is one cooking gadget that she’ll be thrilled to unwrap and even more excited to put to work. The KitchenAid Artisan Stand Mixer is one of the most coveted kitchen appliances, and it’s not hard to see why. With a reputation for mixing, folding, combining and churning everything from batter to bread dough, the KitchenAid Mixer saves time and energy in the kitchen — something every woman appreciates. Plus, the KitchenAid Mixer looks gorgeous even just sitting on the counter. Available in more than two dozen glossy color schemes, it’s sure to become the crown jewel of any woman’s kitchen. Buy it for its versatility, and because every woman will love cooking with this kitchen companion. If the two of you have traveled a lot or hope to getaway more — this pushpin world map will help you mark off all of the places you've been and help you identify where to next. You can personalize this with your name and your wedding date. Once you receive this framed 20" x 26" map you can start adding pushpins to all the destinations you've been. Take note of all the places she mentions she'd like to go for a surprise anniversary trip for next year.